MANY theatres across London are struggling for audiences at the moment. There’s no one reason – it’s a combination of negatives from the weak dollar (which is affecting the tourist industry as a whole), the onset of the summer holidays and some very high profile sub-standard productions. All of these reasons have a knock-on effect from the top (the West End houses) to the bottom – the Fringe theatres, of which Camden has several. So, should being so close to the glamour and glitz of the West End be a help or a hindrance to the Fringe circuit? In theory, if a member of the public buys a theatre ticket and enjoys the experience, it would be assumed that person should be encouraged to purchase again. So, amid this growing concern of falling audiences, should all theatres be helping each other by promoting shows in rival venues? Go into any Fringe ­theatre in Camden or the rest of London and somewhere near the tiny, cramped box office you’ll find a leaflet rack – usually supplied by distribution companies Impact or London Calling – promoting all kinds of other entertainment from long-running West End musicals to events at the Royal Opera House and, occasionally, shows at other Fringe venues. The Fringe theatres make no money from displaying these racks and they are allowed to remain as they provide a helpful service to the theatre’s customers. However, go into most West End theatres and these generic racks are noticeable by their absence. 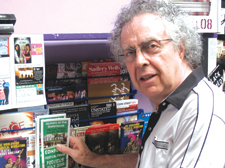 The only point-of-sale fixtures are carefully placed leaflet dispensers which promote shows in the theatre-owner’s other venues. The closest most West End houses come to recognising there is a Theatreland out there is the display of the London Theatre Guide, produced by SOLT (Society of London Theatres) – but then SOLT does have an obligation to promote productions on behalf of all its members. Impact and London Calling have, I understand, been refused access to the foyers of most West End Theatres. Maybe the Fringe should do likewise. Recently I approached The Prince Edward Theatre, where Jersey Boys is playing, to ask if I could display leaflets for Upstairs at the Gatehouse’s production of Forever Plaid. Both shows would attract a similar audience, and I thought it might have been nice for The Prince Edward to support a Fringe theatre. Over the past few years, with the exception of the Nimax Group-owned theatres with whom we have secured a leaflet exchange – Buddy and Forever Plaid seemed a sensible swap – I have received a similar response from other West End venues. Whether begging and borrowing costumes, using actors on profit share productions, or lack of advertising budget, Fringe theatre always struggles to survive. But survive it does and often does a lot more than just survive. I sometimes wonder where the West End would be without the Fringe and the answer is probably still in the West End and not really caring either way. It’s a bit like asking a big brother to help a little brother. In some families it happens, in some it doesn’t. So can the members of SOLT be persuaded that installing a leaflet rack would help the industry as a whole or will it be seen as “God forbid we should advertise a rival’s show”. A few years ago, an organisation called FTN helped Fringe Theatres to present a united front. It campaigned and spoke out on all sorts of issues from health and safety to collective marketing. Sadly, through lack of funding, FTN is no longer with us, and most fringe theatres have neither the time nor resources to promote their own shows let alone help others in the same predicament. If the Fringe theatres did have a collective voice similar to SOLT, perhaps we could all ban West End show leaflets from the racks in our foyers. But that would seem a little churlish, wouldn’t it? Moreover, it appears I don’t even have the entire support of the Fringe. Going to Jackson’s Lane Arts Centre (armed with Forever Plaid flyers and information on our upcoming Jim Bowen shows), I was told that it was venue policy to only display leaflets for their own shows. I’m not sure, but an industry-wide strategy of “Let’s all help each ­other” by developing the occasional theatregoer into a regular theatre goer (via leaflets and flyers) seems a long way off.